baseball, softball and t-ball are just some of the opportunities one can partake in while at the Sportspark. The Sportspark's main objective is to provide a safe and specialized venue for all the participants of the Sportspark's organized youth baseball program. The objectives of the Sportspark contribute to the advancement and more importantly, the enjoyment of organized youth sports in El Paso County. In an effort to protect the youth participants and raise standards at El Paso County Sportspark, every coach, umpire, scorekeeper, and other team volunteer (any individual who will be involved with a youth team as designated by the head coach) will be required to pass a background check. 1. All coaches/scorekeepers/team volunteers that are 16 years of age and older (including any person working with the team or in the dugout or on the field) must submit a signed Consent/Release Form, for a criminal background check, no less than 2 weeks prior to the start of the season. Background checks remain valid for 2 years. 2. Any youth 15 years of age and younger must show proof of age (government issued I’d card, school id or any other government issued document) and wear a helmet in order to be allowed on the field to coach. 3. Coaches will obtain an ID card, after a “passed” background check has been returned. You must contact office in person to obtain results. Coaches/scorekeepers must wear ID card, in plain sight at all times while on the field. • Original Birth certificates are required at the time of registration. Returning players may submit a copy. No Exceptions. • Payment must be in the form of cash, money order or cashier’s check. • A player cannot change teams once they have played a pre-season or league game. • Fees are non-refundable once the season begins. • Coaches are required to pick up their roster prior to the first game from the office at the Sportspark. • Under no circumstances will a player be allowed to play in any game without being on a roster. Players must be able to produce valid identification. • Coaches should check their roster during the first week of pre-season play to ensure that the players wanted on their teams are registered. This will eliminate problems should an illegal protest occur. • Staff will conduct random “on the spot” roster checks throughout the season. Everyone playing must be registered on the official team roster. 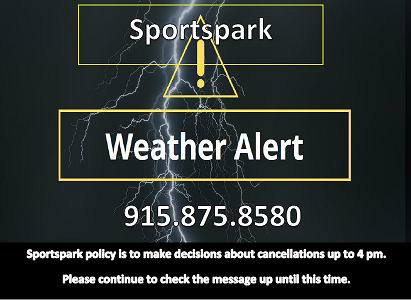 It is the coach's responsibility to make sure all players are cleared with all Sportspark requirements 24 HOURS BEFORE GAME TIME or the game will be automatically forfeited. • Please check the status of your team 24 hours or more in advance, and not at game time. It is the responsibility of the coaches and parents to make sure their team is cleared to play at the park. No protests will be considered. ALL TEAMS SHOULD CHECK QUICKSCORES DAILY FOR GAME CHANGES. Click on the REGISTRATION BUTTON ABOVE for Registration Dates and Times in a chart! The age cut-off date is May 1, 2019 for T-Ball, Coach Pitch & Baseball - Winter 2018/2019, Spring 2019, and Summer 2019 Leagues. The age cut-off date is May 1, 2020 for T-Ball, Coach Pitch & Baseball - Fall 2019 League.